"They were fighting tradition and change. It just wasn't my time." "A great change is at hand, and our task, our obligation is to make that revolution, that change, peaceful and constructive for all. The Stand in the Schoolhouse Door was one of two major confrontations that took place at The University of Alabama that served to "punctuate dramatic campaigns in the movement for civil rights" (Clark, 1995, xvii). The first event took place in February, 1957, two months after the initiation of the Montgomery Bus Boycott. This event dealt with the attempt by an African American woman, Autherine Lucy, to enroll in classes at The University of Alabama. After receiving notification that she could enroll in classes at the university, Ms. Lucy came to Tuscaloosa. After three days of confrontations, demonstrations, and violence, she was driven from the campus on February 11 and later suspended. On February 29, through a court order, Lucy was ordered to be readmitted to the university. She was later expelled by the university's Board of Trustees. These events led to great sympathy for this young woman and gave the university the "dubious distinction of being the first educational institution ordered to desegregate under the Brown v. Board of Education implementation decree and the first where a course order was effectively flouted by a determined show of massive resistance" (Clark, 1995, xvii). The second event, The Stand in the Schoolhouse Door, is known as a significant event in the struggle for Civil Rights. This event, the attempt by two other African Americans to attend The University of Alabama was also a stand off between state and federal leaders. Vivian Malone and James Hood sought their right to attend this state university on June 11, 1963. 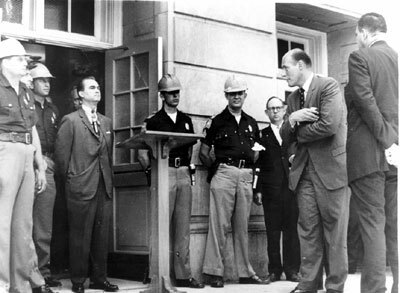 The governor of Alabama, George C. Wallace, refused to allow the students to enter. After President John F. Kennedy federalized the National Guard, Wallace made his famous stand in the School House Door, read his proclamation, then stepped aside and allowed the students to enter and become the first African Americans to attend The University of Alabama. This photo is courtesy of the Tuscaloosa News. Hear Dr. E. Culpepper Clark talk about the Schoolhouse Door.